Click here for a map of the territorial divisions of France along religious and political lines. The religious wars began with overt hostilities in 1562 and lasted until the Edict of Nantes in 1598. It was warfare that devastated a generation, although conducted in rather desultory, inconclusive way. Although religion was certainly the basis for the conflict, it was much more than a confessional dispute. "Une foi, un loi, un roi," (one faith, one law, one king). This traditional saying gives some indication of how the state, society, and religion were all bound up together in people's minds and experience. There was not the distinction that we have now between public and private, between civic and personal. Religion had formed the basis of the social consensus of Europe for a millenium. Since Clovis, the French monarchy in particular had closely tied itself to the church -- the church sanctified its right to rule in exchange for military and civil protection. France was "the first daughter of the church" and its king "The Most Christian King" (le roy tres chretien), and no one could imagine life any other way. "One faith" was viewed as essential to civil order -- how else would society hold together? And without the right faith, pleasing to God who upholds the natural order, there was sure to be disaster. Heresy was treason, and vice versa. Religious toleration, which to us seems such a necessary virtue in public life, was considered tantamount to letting drug dealers move next door and corrupt your children, a view for the cynical and world-weary who had forgotten God and no longer cared about the health of society. Innovation caused trouble. The way things were is how they ought to be, and new ideas would lead to anarchy and destruction. No one wanted to admit to being an "innovater." The Renaissance thought of itself as rediscovering a purer, earlier time and the Reformation needed to feel that it was not new, but just a "return" to the simple, true religion of the beginnings of Christianity. These fears of innovation certainly seemed justified when Henri II died suddenly in 1559, leaving an enormous power vacuum at the heart of social authority in France. The monarchy had never been truly absolute (although François Ier made long strides in that direction), and had always ruled in an often uneasy relationship with the nobility. The nobles' sense of their own rights as a class, and the ambitions of some of the more talented, were always there to threaten the hegemony of the crown. When the vacuum appeared, the House of Guise moved in. François II, although only 15, was married to Mary Queen of Scots, a niece of the Duc de Guise. The Guise were a cadet branch of the House of Lorraine (an independent imperial duchy) that were raised to the peerage by François Ier. They were ambitious and had already produced at least two generations of exceptional leaders. The duc de Guise, François, was a military hero, and his brother, the Cardinal de Lorraine, was a formidable scholar and statesman. During François II's brief reign, Guise power was absolute. This greatly threatened the House of Montmorency, an ancient line which had enjoyed great political prominence under Henri II, as well as the Bourbons, who as the first princes of the blood had the rights of tutorship over a minor king. François II was not technically a minor (14 was the age of majority), but he was young and sickly and no one expected much from him. These dynastic tensions interweave with the religious and social ones. The Bourbon princes were Protestant (the Antoine de Bourbon, King of Navarre and the Louis de Bourbon, Prince de Condé), and although the constable de Montmorency was Catholic, his nephews, the Châtillon brothers (including Admiral de Coligny) were Protestants. The Guise identified themselves strongly as defenders of the Catholic faith and formed an alliance with Montmorency and the Marechal St. André to form the "Catholic triumvirate." They were joined by Antoine de Bourbon, who flip-flopped again on the matter of his religion. His wife, Jeanne d'Albret, the Queen of Navarre, remained staunchly Protestant and established Protestantism completely in her domains. Catherine de' Medici tried to promote peace by issuing the "Edict of Toleration" in January '62, which made the practice of Protestantism not a crime, although it was restricted to preaching in open fields outside the towns and to the private estates of Huguenot (Protestant) nobles. This was not well-received by many Catholics. The first religious war was provoked by the Massacre at Vassy in '62. The Duc de Guise, travelling to his estates, stopped in Vassy on a Sunday and decided to hear Mass. A few of his servants got into a scuffle with some Huguenots who were attending a service in a nearby building, and the whole thing escalated until the Guise faction had fired on the unarmed Huguenots, set the church on fire, and killed a number of the congregation. The national synod for the reformed church met in Paris and appealed to the Prince de Condé to become the "Protector of the Churches." He, his clients, and their respective client networks took on the task, and from this point the leadership of the Huguenots moves away from the pastors towards the noble "protectors", and takes on a more militant tone. Condé mobilizes his forces quickly and moves decisively to capture strategic towns along the waterways, highways, and crossroads of France. He takes a string of towns along the Loire and makes his headquarters at Orléans. He also contracts with Protestant leaders of Germany and England for troops and money. The royal forces are slower to respond, as the permanent garrisons are located along the Habsburg frontiers. Catherine de' Medici was forced to turn to the Guise faction to deal with this alarming development. The Guise in turn sought help from the Pope and Phillip II of Spain. The Protestants were well dug-in in their garrisons, and the siege efforts to recapture the towns were long and costly. Only one open pitched battle was fought: that at Dreux which was a Catholic victory. At it, the Protestants captured Montmorency, the Catholics captured Condé. The young Admiral de Coligny managed to safely withdraw most of the Protestant forces to Orléans, which was then beseiged during the winter of '62-'63. At Orléans, the Duc de Guise was killed by an assassin. Antoine de Bourbon had been previously killed at the siege of Rouen, and this last casualty pretty much eliminated the first generation of Catholic leadership. With the Huguenot heartland in the south virtually untouched and the royal treasury hemorrhaging, the crown's position was weak and Catherine bent her efforts towards a settlement. The noble prisoners were exchanged, and the edict of Amboise issued in March '63. This restricted Protestant freedoms somewhat, allowing worship outside the walls of only one town per bailliage, although the nobility still had the freedom to do as they would on their estates. This increased the resentment and tension in the towns and was generally unsatisfying to most. Even though the Duc de Guise had died, the Guise faction remained powerful and the Cardinal de Lorraine consolidated his power even more. He argued for more vigorous suppression of the Huguenots in response to Protestant insurrection in the neighboring Low Countries, where outbreaks of iconoclasm were met with fierce repression by Spain. Catherine began a two-year tour of the provinces with her son Charles IX, as part of an effort to establish a sense of unity with the nobility. During this time, she passed through Bayonne and met with the Duke of Alva, the King of Spain's "hard man" in the subjugation of the Netherlands. This spread a ripple of alarm through the Protestant community. When the Spanish marched troops along the "Spanish Road" from Italy to Flanders, their presence on the eastern borders of the kingdom added to the panic. The rumor that Catherine was plotting with Spain to exterminate them caused the Huguenots to attempt a coup at Meaux, to seize the person of the king and get him away from the Guises. This plan failed, and provoked the second war. This was much a repeat of the first. At the end of it, Montmorency was dead, the crown was more in debt, and the Peace of Longjumeau was a pretty much the same as the Peace of Amboise. It was destined to be short-lived. The Cardinal de Lorraine hatched a plot to overturn the peace and capture Condé and Coligny. They escaped to La Rochelle and raised another army to begin the third war. Condé and Coligny made an alliance with William of Orange in the Netherlands, who was fighting for the independence of the United Provinces from Spain. The Guise became ever more closely involved with Spain. The Cardinal de Guise also saw in Mary Stuart, Queen of Scots, a tool for unseating Elizabeth and putting a Catholic monarch on that throne as well. (As long as Elizabeth was childless, Mary was next heir to England.) The third war therefore involved a even larger number of foreign interests, and lasted from '68 to '70. The Protestant strategy this time was to fortify the Southwest and stand off the crown. This was reasonably successful for a fairly long time. However, at Jarnac, under the nominal leadership of the king's younger brother, Henri d'Anjou, the Protestants suffered a great defeat and the Prince de Condé was killed. Coligny met the Catholics at Moncoutour and suffered another defeat. However, he collected his forces and made a brilliant "long march" across the south of France, defeating the royal army on at least one occasion and depriving the crown of their chance to break the Protestant hold on the South. The cost of keeping the army in the field was telling on the crown again, and yet another peace was negotiated at St. Germain. This peace was more favorable to the Protestants than the previous, naming specific towns as secure strongholds, returning confiscated property to Huguenots, and guaranteeing some equality before the law. This third war was more protracted, and brought the war to the rural areas in central and southern France, spreading the suffering to the population and raising the cultural tensions between Catholics and Protestants. After the peace of St. Germain, Catherine exerted a great deal of diplomatic effort trying to create harmony between Catholic and Protestant leaders. Admiral de Coligny, now the chief military leader of the Huguenots, was welcomed into the king's council, Elizabeth of England entertained the prospects of marriage to one of King Charles' younger brothers, and Catherine negotiated with Jeanne d'Albret, Queen of Navarre, to marry her daughter Margeurite (Margot) to Henri de Navarre, the ranking Huguenot prince of the blood. However, the common people felt no such harmony, and tensions grew in the towns and countryside. Protestant rhetoric had become increasingly revolutionary in the late 60's, with leading thinkers advocating that Christians did not have the obligation to obey leaders who themselves defied God. Calvin himself came to the conclusion, after advocating for many years that obedience to the civil authorities was a Christian duty, that a prince that persecuted the church had forfeited his right to be obeyed. François Hotman's Francogallia was written during this time (although not published until 1573). It advocated the existence of a mythical Frankish constitution whereby the kings of France were elected by the people and governed only through their consent. This was all very frightening and served to unite the Protestant faith with treason in the mind of the average person. Along with these more abstract issues, tension between Catholics and Protestants had some more mundane economic and social elements. Protestants were often represented in the newer and more lucrative trades, such as printing, out of proportion to their numbers in the general population. The Protestant emphasis on literacy as the basis for understanding the Bible made for a generally better educated group. Protestantism was more an urban than a rural phenomenon (except in the Southwest), one well-suited to capitalists and merchants. For example, the 100 or so Catholic feast days that they didn't celebrate made for more days to do business. This wasn't viewed as being much of an advantage by the peasants, but was viewed as an unfair advantage by other Catholic townsmen. The years of persecution had created a cell-like structure of congregations, consistories, and synods where people in the group stuck together and helped each other, both in matters of religion and everyday business. Like that other minority in Europe, the Jews, this engendered a feeling of suspicion about their "secret" organization. The participation of women in the church service, with men and women singing together and studying the Bible, was viewed with a range of emotions: from a sign that society was collapsing when cobblers and women could debate the meaning of the Bible (even the Protestants were sometimes alarmed at the effects of their doctrine about "the priesthood of all believers"), to a conviction that Protestant worship must involve some kind of orgiastic rituals. Prices had also risen very sharply between the beginning of the century and the 1560s, especially the prices of food, fuel, and shelter. This might seem irrelevant to matters of religion, but the sense of stress about making ends meet, increasing homelessness and poverty in the towns, a sense of anxiety about the future, and all the other things that go with this kind of economic pressure make for a fearful and hostile society looking for scapegoats. Many Catholics felt that the toleration of heresy in their midst was like a disease in the body of Christ that threatened the very contract between God and his people. There was an increasing rhetoric among the popular preachers to purge this infection to restore God's favor and with it, social stability. All of this tension is important background to the watershed event of the wars: the evening of August 23, 1572 -- the feast of St. Bartholomew. The 19 year-old Henri de Navarre and Margot de Valois were married in Paris on August 17 and the festivities were still going on. The entire Huguenot leadership came to Paris for this wedding. Henri himself brought 800 mounted noblemen in his train. On August 22, as Admiral de Coligny was returning to his lodgings from a visit with the king, an assassin fired at him, breaking his arm and wounding him severely, but not killing him outright. The Huguenots were outraged and demanded justice from the king. Everyone suspected the Guises of the attack. When various Huguenot leaders counselled Coligy to flee the city -- certainly at this time they could have easily made it to the safety of a Protestant stronghold -- he reputedly refused, feeling that it would show a lack of trust in the king. However, the Huguenots were threatening riot in the streets if something wasn't done, and it was a very hot summer. At some point during the night of August 23, the decision was taken at the Louvre to kill Coligny and the Huguenot leaders gathered around him. Charles IX was certainly there, Catherine de' Medici, Henri d'Anjou. It may not have been originally intended to be a general massacre. Charles IX was reputedly badgered into this decision by Catherine and his councillors, and when he finally broke he is alleged to have said, "Well, then kill them all that no man be left to reproach me." During the early hours of Sunday morning, a troop of soldiers came to Coligny's door. They killed the guard that opened the door, and rushed through the house. Coligny was dragged from his bed, stabbed, and thrown out the window to the pavement below. Reputedly the Duc de Guise mocked the body, kicking him in the face and announcing that this was the king's will. Rumors ran thick and fast, and somehow the militia and the general population went on a rampage, believing themselves to be fully sanctioned by the king and the church. Catholics identified themselves with white crosses on their hats, and went around butchering their neighbors. The neighborhood militias played a very significant role in the slaughter. The killing went on for 3 days or so, with the city councillors and the king unable to bring the whole thing under control. There are numerous tales of atrocities, occasional ones of courage and compassion. Historians have debated what really happened and why in excruciating detail ever since. The Louvre itself was not immune. Henri de Navarre slept in his bridal suite with an entourage of 40 Huguenot gentlemen, all of whom were killed. Henri and his cousin, the Prince de Condé (another Henri, the son of the late Louis who had been the champion of the churches), were dragged before the king and threatened with death if they did not convert. They did, and Navarre became a prisoner of the court for the next four years, living in constant fear of his life. The massacres spread to the provinces over the next few months. Some thought they had directives from the crown to kill all the Protestants, others thought there was no such thing. The actions of the governors and mayors depended very much on the individuals and the circumstances in their areas. Areas with vocal Protestant minorities often suffered the most. 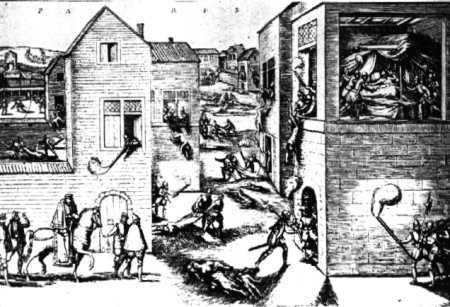 The St. Bartholomew's Day Massacre, as it came to be known, destroyed an entire generation of Huguenot leadership. Henri de Navarre was a prisoner, not yet a known quality as a leader. Condé eventually escaped to Germany, and Andelot, Coligny's younger brother, was an exile in Switzerland. Although it wasn't clear at the time, this was the beginning of the decline of the Protestant church in France. In spite of the wars, the '60s had seen an enthusiastic growth in the Religion. Over the months following, many Protestants despaired and abjured their faith. The experience radicalised many of the survivors, creating a profound distrust of the king, an unwillingness to disarm, and an upsurge in the political rhetoric of resistance. Works with titles like The Defense of Liberty against Tyrants were to come off the Huguenot presses. The Huguenot "state within a state" became solidified, as the churches organized themselves into an efficient hierarchy for communications and self-protection. They collected their own tithes, maintained their own armies and garrisons, and provided for the governance and social welfare of the Protestant communities. The fourth war was set off when the city of La Rochelle, the de facto capital of the Protestants, refused to pay taxes to the king because of the massacre and refused admittance to the royal governor. The king declared war on the town in November '72 and finally got an army to beseige it in February. The army was nominally led by Henri d'Anjou, and included Henri de Navarre as a hostage. Being a port city that was easily resupplied by sea, with a near-impregnable harbor, La Rochelle was not easily reduced. There were high casualities on both sides, and the royal treasury began to feel the strain. The siege was called off in May, as Catherine began to prepare for the election of the Duc d'Anjou to the throne of Poland. The Treaty of La Rochelle was disadvantageous to the Protestants, and left them certain to break it when they were strong enough. In 1574, Charles IX died, sweating blood and reputedly tormented with guilt for the massacre. His brother, Henri, now installed as king of Poland, lost no time giving the slip to his Polish courtiers and heading for the border. He took a leisurely tour of Italy and then arrived in France to take up the crown. The people remembered him as the "young eagle" of Jarnac and Moncontour, and were looking to him to take a strong hand and settle things down in the kingdom. This was not to be. Henri III's reign was tormented by the impossibility of peace. Meanwhile, Condé was raising money, troops, and support from the German princes, particularly Jan Casimir, the son of Frederick III of the Palatine. Henri de Montmonrency, the Sieur de Damville, Governor of Languedoc, who ruled his region as like an "uncrowned king of the south," brought another substantial army to the Protestant side. Although he himself was Catholic, the Languedoc was a heavily Protestant region and he was related to the Coligny brothers. In February '76 Navarre escaped from the court and headed into his own territory, raising an army behind him. The king's younger brother, the Duc d'Alençon, the last of the Valois sons, began to play to the anti-royalist factions. His propagandists put out manifestos portraying him as alternative ruler to the current king, one able to speak up for the rights of the people and rule more justly -- cutting taxes all the while, of course. This was a potent alliance, one for which Catherine had no good counter at the time. When 20,000 troops invaded France under Jan Casimir in the spring of '76 and these various armies collected themselves together in the heart of France within striking distance of Paris, the crown was forced to negotiate. The Edict of Beaulieu, otherwise known as the Peace of Monsieur ("Monsieur" being the traditional title for the reigning king's next-oldest brother) was signed in May and was very favorable to the Protestants. In separate private agreements, the leaders got substantial settlements: Navarre was confirmed as Governor of Guyenne, Condé was made Governor of Picardy, Alençon was made Duc d'Anjou and given a raft of titles, and the crown agreed to pay the bills for Jan Casimir's mercenaries. It left Henri III smarting. The Parlement of Paris refused to register it, and some of the towns ceded to the Protestants refused to admit their troops. Picardy, for example, refused to admit Condé to his capital. In the spring of '76, a convocation of the Estates General was held. The Protestants had been pushing for this for some time, but when it came, there were almost no Protestant delegates. The Estates advocated establishing one religion in the realm, and Henri III demanded new taxes and revenues in order to finance such a project. The Estates somehow wanted this to be done without spending any money. The cost of the wars was driving up the national debt beyond the level of endurance, and it made staunch absolutists like Jean Bodin (whose Six Books of the Commonwealth was published in 1576) question the value of enforcing the royal prerogatives at such costs. This year saw the formation of the first attempt at a Catholic League to oppose the Protestants if the king would not. To coopt this threat to his authority, Henri III declared himself the head of it. However, somehow a royal force was put together to take back some of the Protestant towns along the Loire. La Charité fell in May of '77, but the bulk of the Protestant forces were at large in the South and there was no hope of a victory over them. The Peace of Bergerac was signed in July. It was more restrictive in allowing places of worship to the Protestants than the previous peace, but was still largely the same. It disallowed any leagues and associations, trying to fend off the growing movement from the Catholic right wing. This was a brief flurry of activity, the most notable of which was Henri de Navarre's seizure of the city of Cahors. Sometimes called "The Lovers War", it seems to have been some kind of maneuvering between Navarre and the crown in which Queen Margot was involved. It didn't last long, and Navarre and Catherine de Medici signed the Treaty of Nerac, followed by the Peace of Fleix.. Henri consolidated his control of the Southwest and bided his time. The Duc d'Anjou spent these years (1580-1584) intriguing and trying to acquire the sovereignity of the Netherlands, who were seeking a prince to replace Phillip II, the king of Spain against whom they were in rebellion. Although not a Protestant himself, or even truly sympathetic to them, this seemed his best opportunity for a place in the world until his older brother died. When Anjou died in '84, it precipitated a new crisis. King Henri III was childless and looked to remain so. With the death of Anjou the heir presumptive became a Protestant: Henri de Navarre.